Maccaferri Iberia set out to provide a green, sustainable and visually attractive lanscaped wall featuring gabions. “Avenida Meridiana” together with “Avenida Diagonal” are the two most important access routes into the city of Barcelona. 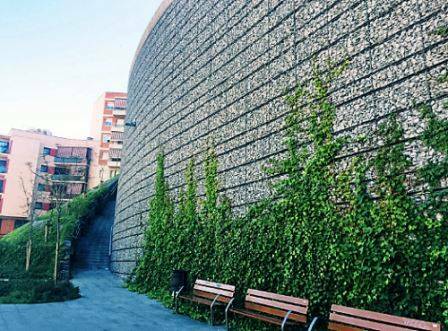 In the area of “Puente de Sarajevo”, a screen of CFA piles was executed together with a slope that required landscaping with a green wall. More than 50,000 cars daily pass along this avenue, and they are welcomed by a poster saying WELCOME TO BARCELONA. The sign is positioned directly in front of this new landscaped green wall. Berms were included within the landscaped slope to allow for the mixture between mesh /stone/vegetation to appear attractive. Over time, the climbing plants on the installation will cover the man-made elements, giving it a fresh and natural appearance. The installed planters were waterproofed with our Macline SDH 150 geomembrane. The entirety of the rear side was wrapped with Macdrain W 1051 geomat to control water within and behind the structure. In light of the irregularity of the piles surface, Maccaferri decided to make a metallic structure attached to the same screen. This structure acts both as a ventilated façade, while serving as a support for the gabion fascia. For more information, please contact our Iberia’s Subsidiary. For more technical details please download the case history from the Iberia’s Subsidiary.